RT the state-funded Russian television station is airing an interview Thursday of two Russians that have the same name as the men accused by British authorities of attempting to assassinate a former Russian spy as well as his daughter, said the television station. 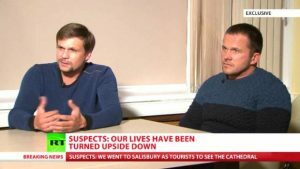 Last week prosecutors in Britain identified the two Russians that are accused of operating under the aliases Ruslan Boshirov and Alexander Petrov, whom they have accused of attempting to kill Sergei Skripal and daughter Yulia in England by using a military-grade nerve agent. The RT’s editor in chief posted on social media that she met and had interviewed both men Wednesday night, and that interview airs Thursday on RT. The editor in chief was quoted by another television station in Russia as saying to her surprise the two spoke in some detail about their work and how they earn their living. The editor in chief said both men had made direct contact with her and that she had not sought out the two personally. Britain said that the two suspects were intelligence officers from the Russia military and were acting on orders handed down from somewhere high up in the government of Russia. The Kremlin has denied involvement of any kind in this case. Skripal, a former colonel in the GRU who betrayed several agents to the MI6 intelligence service in Britain, and his daughter were discovered unconscious on a Salisbury bench last March. The two spent weeks at a hospital prior to being discharged. In July, the case was back in the headlines when a woman, who lived near Salisbury, died and Charlie Rowley her partner became ill after Rowley had discovered a counterfeit bottle of perfume that contained the nerve agent Novichok and brought it to his home.